The ExtendCrvOnSrf command lengthens a curve on a surface to the specified surface edge. 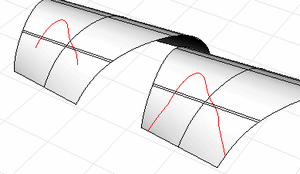 Select curves on a surface. Specifies which end of the curve to extend. Extends only the start of the curve. Use the CrvStart command to locate the start of the curve. Extends only the end of the curve. Use the CrvEnd command to locate the start of the curve. Extends both ends of the curve. Use the CrvStart or CrvEnd commands to locate the start/end of the curve.